Much of south Africa was gripped with a cold spell that brought snow to the highlands and freezing rain to much of the coast stretching down the east and south of the country. So much for a temperate winter! The photographers I joined on this month's Thanda Wildlife photography workshop came to grips with icy rain and freezing wind as we attempted the impossible...to find animals that were as mad as us in the open. This isn't actually as easy as one would think. Naturally wild animals don't have a warm centrally heated brick house with double glazing to call home. Still, what shelter they can get they will needless stick to, whether it's a burrow in the ground or a close-standing group of acacia. It's only idiotic wildlife photographers that come out in the open to greet the slushy drops of cold water with apparent glee. Well in the hopes of creating great images at any rate. I have a habit of saying that bad weather means for great images. It often does, but only if something actually happens during that bad weather. Hey ho. Thankfully the cold spell blew (in a gale force wind) away eventually. It left motorists stranded on a pass between Kwazulu-Natal and the interior as snow built up to over a foot deep on the middle of the highway. 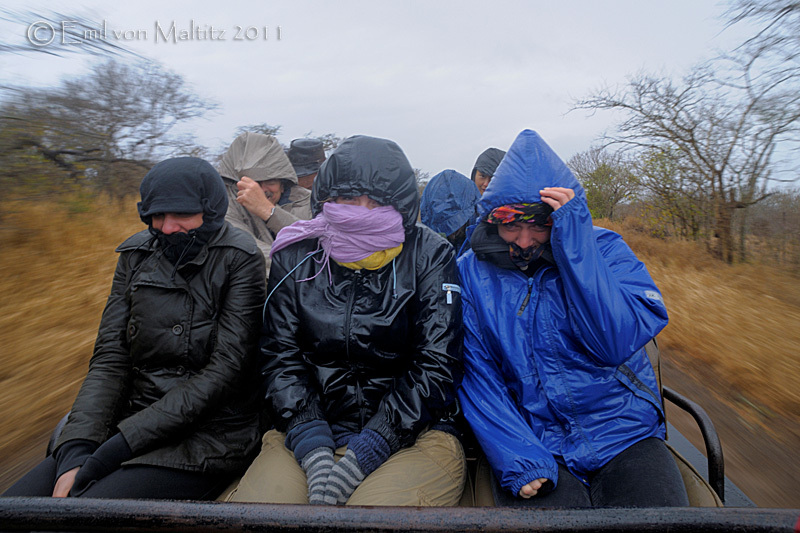 In Zululand it meant for uncharacteristically cold and wet winter weather. But shoot on we did! One of the inherent problems with wildlife photography and game drives is the angle of view that the photographer is forced to accept. Whenever one goes to workshops, reads books, and watches photographers on television, the idea is pounded home that the animal needs to be on the same eye-level as the photographer. The reason why images by the likes of Nick Nichols and Frans Lanting are so powerful is that the camera's lens is on the same level as that of the animal's eye. This creates a connection between the viewer and the subject, a pathos develops if you would like. We are placed in the same 'space' as the animal occupies. This connection is severed once the all-important eye-contact and eye-level view are lost. At what stage in the wild would we possibly be on an angle above a lion? This is difficult for any enthusiast photographer to deal with. 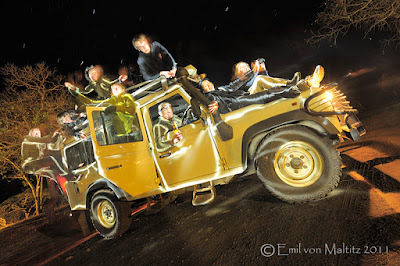 The average enthusiast does not have the means available to photograph big five animals from anything but a game viewer vehicle (traditionally an open top Land Rover or Land Cruiser). Professionals usually put a lot of money and time into getting unique images by getting not only eye-contact, but either eye-level angles or an angle that is out of kilter with the usual view of the animal (think of Nichol's image of a blue gelled Rhino from ground level, his image of a tiger jumping across a stream - and the remote camera, Andy Rouse's shot of a muddy elephant chucking wet mud at a low angle camera). They do this by using remote camera's, special vehicles, and, getting out of the vehicle. This is not something your average photographer is even allowed to do. So what do you do? Get down as low as possible in the vehicle. With birds, try and get the guide to start looking out for birds that are at eye-level to you. Ask the guide about spots where the vehicle is likely to go into a hollow in the track or road that could work for animals. 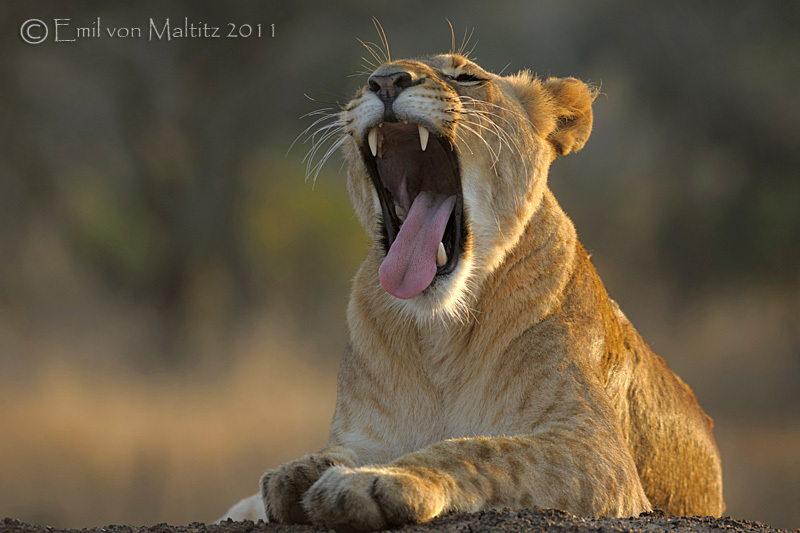 The above shot of a yawning lioness is one of my favourite sites for lions in Thanda Reserve. Here a low dam wall is a regular chill spot for the resident pride of lions. The game viewer ends up being just below the lion's eye-level...perfect for that low level kind of image. Use the guide's knowledge to be able to get good shots. Impress upon them the importance of angle of view. Also, be prepared to accept that getting the incredible Cheetah shot might not happen, but the killer image of a Lilac-breasted Roller, might just. Thanks to a wonderful crew this last month. I enjoyed working with a keen and advanced group that were game for mad dashes in the rain. Now I'm holding thumbs that the sun stays out long enough to dry them and the animals off! Howzit Sean...I would also usually agree with you on the tilt in the horizon (as you probably remember) :) For this kind of funky setup though I think it can work quite well...flickeratti here I come!